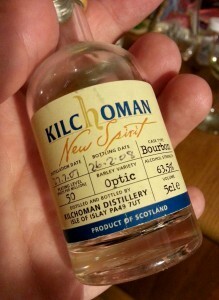 Distilled 27 Juli 2007, 50 ppm in the malt, matured in an ex-bourbon cask, bottled 26 February 2008. Nose: Railway sleepers and rusty iron. Apple sauce, apricots and cucumber. With water jasmine and cardamom. Palate: Soot-covered iron construction. More ashy with water, with an underlying fruitiness. Comments: Where can I get a proper bottle rather than this puny 5 cl? Makes me wonder what the point is to years of maturation, when this is perfectly delightful as is.